A GL Account for Finance Charges collected will need to be added to the Chart of Accounts. Determine which Clients will have Finance Charges applied. 1. 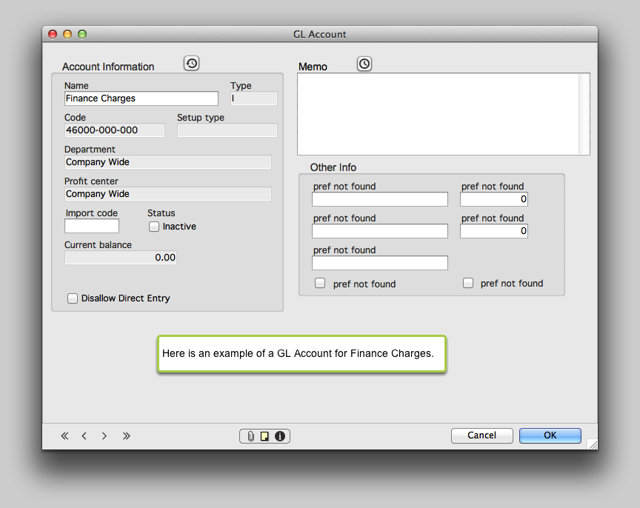 Set Up a GL Account for Finance Charges. See the lesson for details on how to Set Up a GL Account. 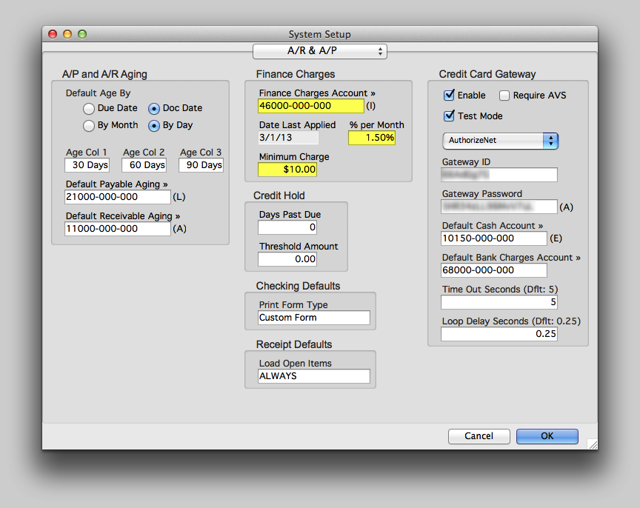 Zoom: Set Up a GL Account for Finance Charges. Enter the Finance Charges GL Account that was created in Step #1. This GL Account will be CREDITED when Finance Charges are calculated. Enter the Finance Charge rate (% per Month). This is the rate that is charged for past due balances when Finance Charges are calculated (only if the Client is set to receive a Finance Charge). This charge is the minimum Finance Charge that will be calculated. If the % per Month yields a charge less than this amount, this Minimum Charge will be applied instead of the percentage. 3. Enable a Client to have Finance Charges applied. Finance Charges will only be calculated on past due balances for Clients who have the Finance Charge box checked on their Client record. Open a Client record and go to the Account Information tab. Check the box here if Finance Charges are to be calculated for past due balances for this Client. Click OK to save the record when finished. 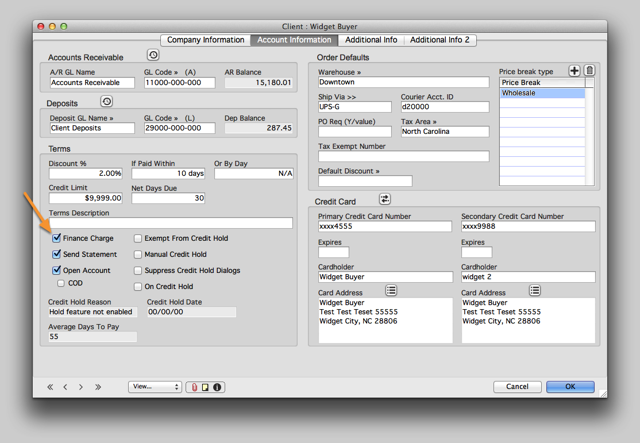 Zoom: Enable a Client to have Finance Charges applied. Finance charges are calculated during the Post Transactions process through the General Ledger module. 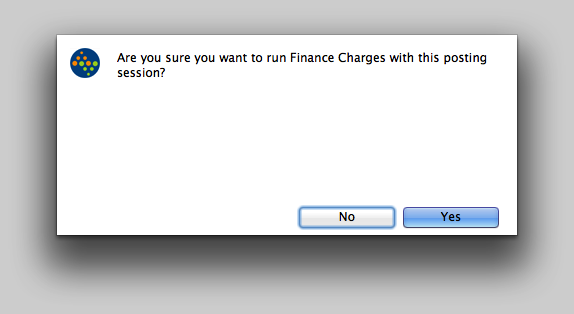 Select the After Posting Option labeled Finance Charges. AcctVantage will calculate Finance Charges on all past due balances for those Clients who have been enabled to receive Finance Charges. 4.1. 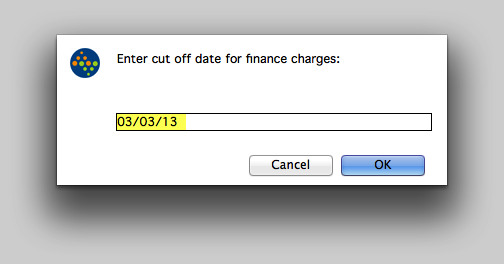 Enter cut off date for finance charges. When the Finance Charges box is checked, AcctVantage will prompt for a cut off date. Finance charges will be calculated for past due balances that fall between the most recent finance charge cut off date and this current cut off date. 4.2. Are you sure you want to run Finance Charges with this posting session? When Proceed button on the Posting window is clicked, AcctVantage will confirm that Finance Charges should be calculated during the current posting session. If No is clicked the posting session will be canceled. If Yes is clicked the posting session will continue and Finance Charges will be calculated. 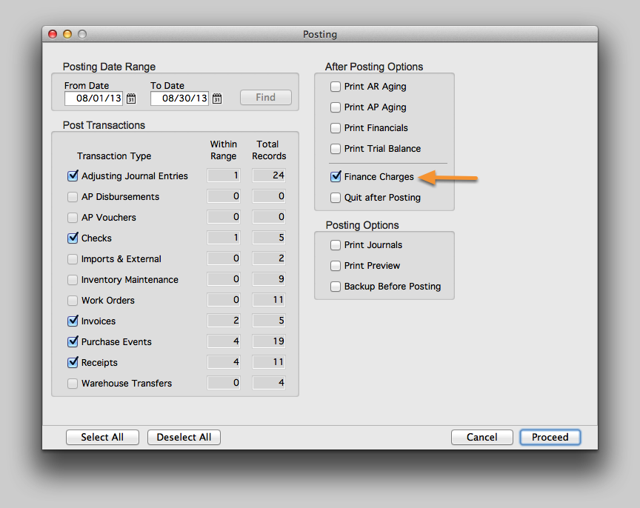 After Finance Charges are calculated they will appear as non-posted Journal Entries. The resulting Journal Entry applies a DEBIT to the Client’s Accounts Receivable Sub Account and a CREDIT to the Finance Charges GL Account. Finance Charges will not affect the General Ledger or the Client’s AR Sub Account until the Journal Entry is posted. After the Journal Entry is posted, the Finance Charge will appear as another AR Aging item on the Client’s AR Sub Account. The item will be included on the Client AR Statement and is subject to incur Finance Charges of its own.